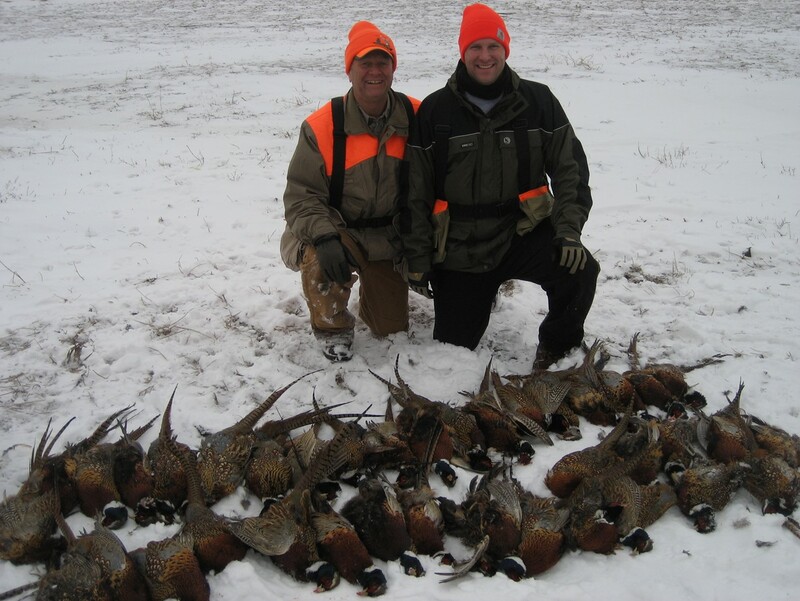 On December 2, 2010 I flew to Minneapolis and was met by Ned who had agreed to not only drive me to Zell, SD but also to bring an extra shotgun since I was flying commercial. We drove about 3 hours to Montevideo, SD where we met Ed and his son Steve for a brief lunch. Ed and Ned are long time friends since high school. 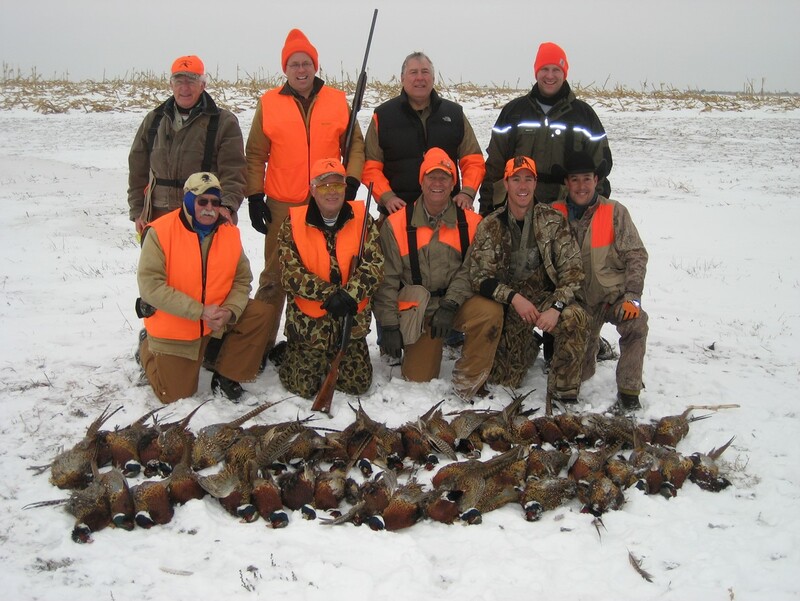 From there, the two-car caravan continued on to Zell, SD to Roger and Deann Zens’ Pheasant Hunting ranch (www.rzpheasanthunts.com). We were the first to arrive at about 6 pm and started right off with cocktails. 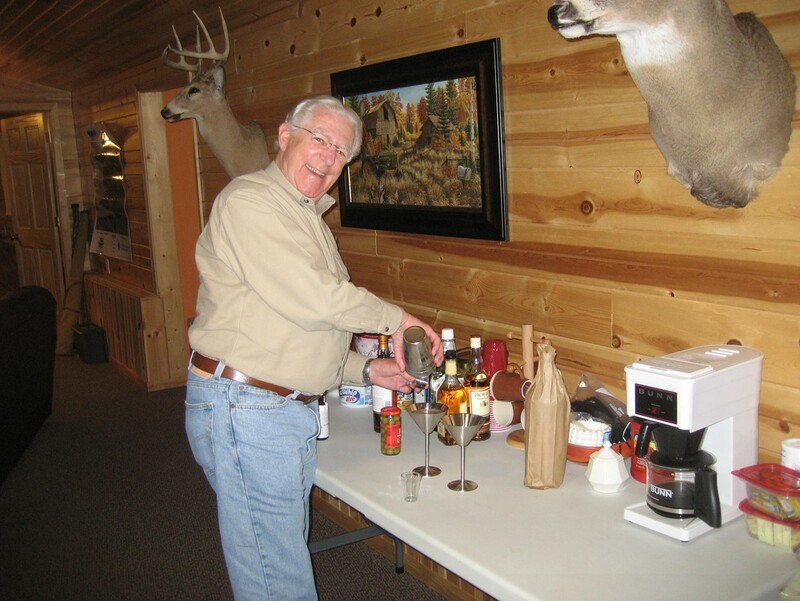 Ned was partial to Martini’s. About an hour later, Rick, Jim, JJ and Shannon arrived from Wyoming and we had a bite to eat. I went to sleep before Rick’s son-in-law Chris arrived. We introduced ourselves in the morning. 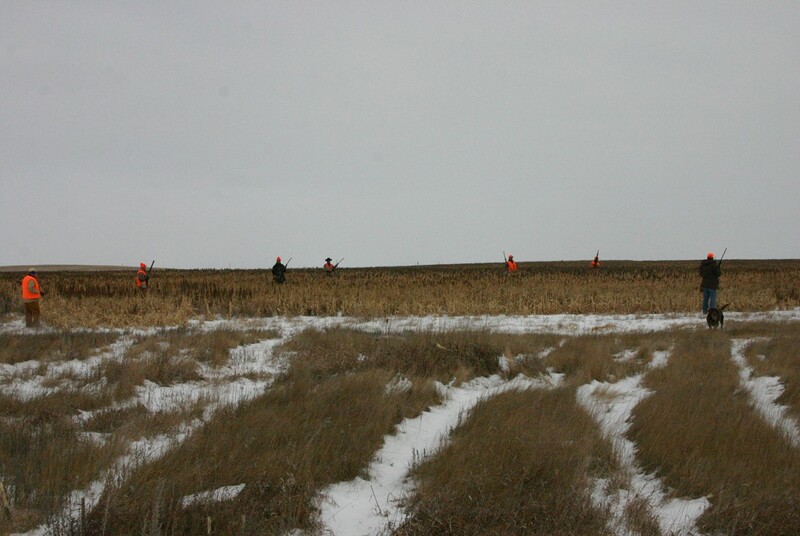 Friday December 3rd was our first day of hunting pheasants and state law prevented us from starting before 10 am. We began the day with a great breakfast of bacon, eggs, and waffles. At about 9:30, Cory arrived and introduced himself to everyone. Cory is Roger & Deann’s son-in-law, married to their daughter Theresa who was the official photographer for the four days. Cory was our guide and learned a little about each of us and then got us organized into blockers and walkers. 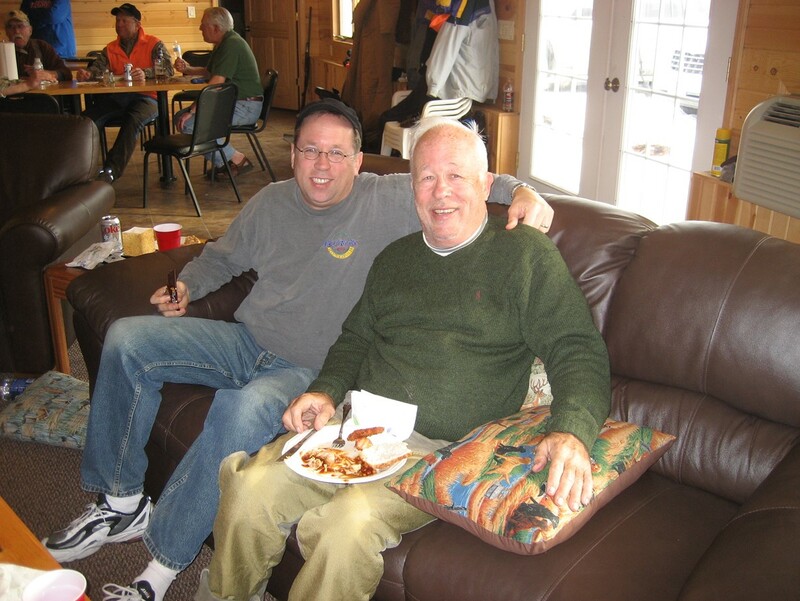 Cory was assisted by his father, Terry who drove one of the vehicles. We boarded two pickup trucks and the little yellow school bus. Getting organized was not easy. 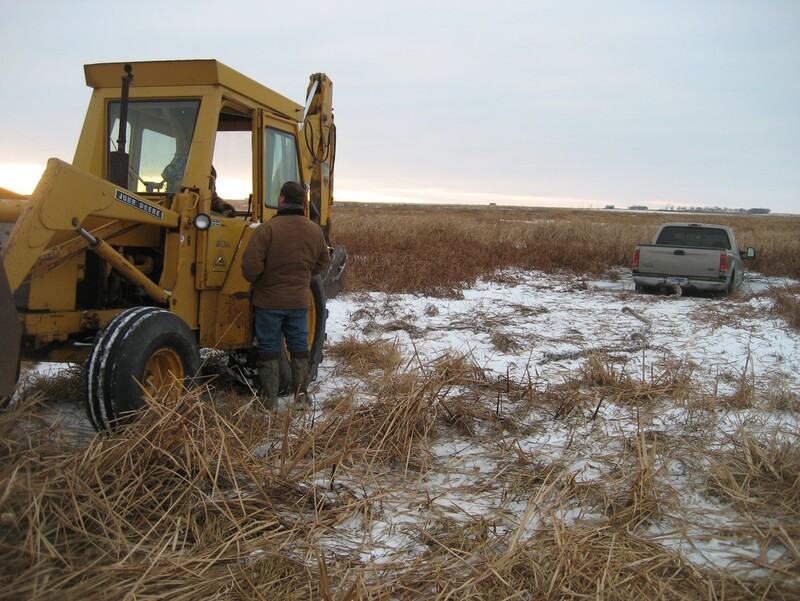 For a rectangular patch of sorghum, there were blockers on the left, right and foot . Then walkers with dogs proceeded from the head to the foot. 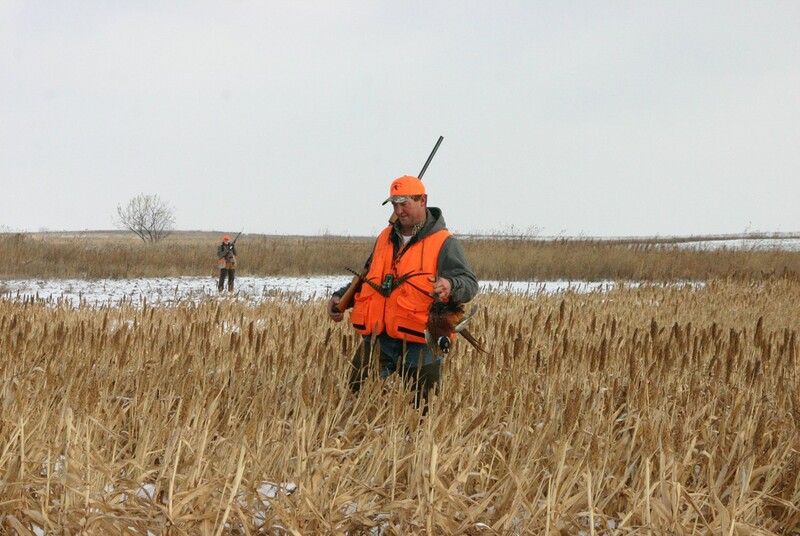 All of the activity, got the pheasants who were resting in the sorghum to fly. Then we had to distinguish the hens from the roosters since it is only legal to shoot roosters. We did quite well on our first day. 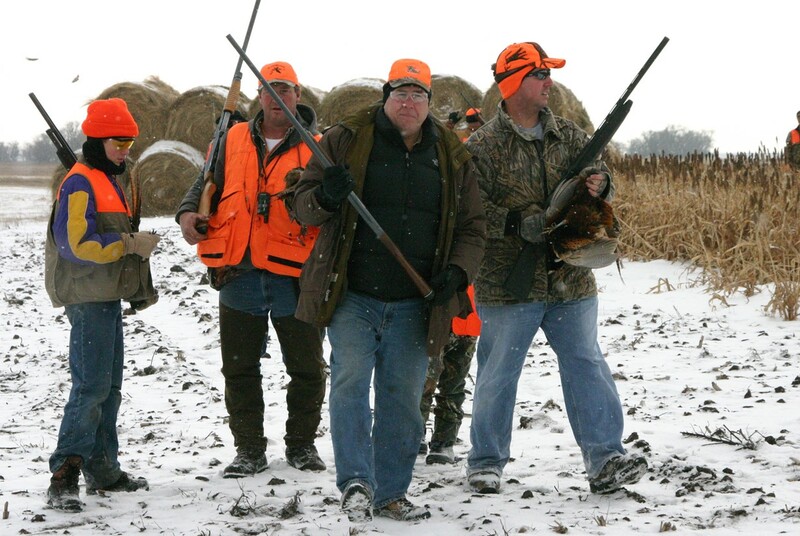 We had our limit of 3 birds per hunter by about 1 pm and returned to the camp. 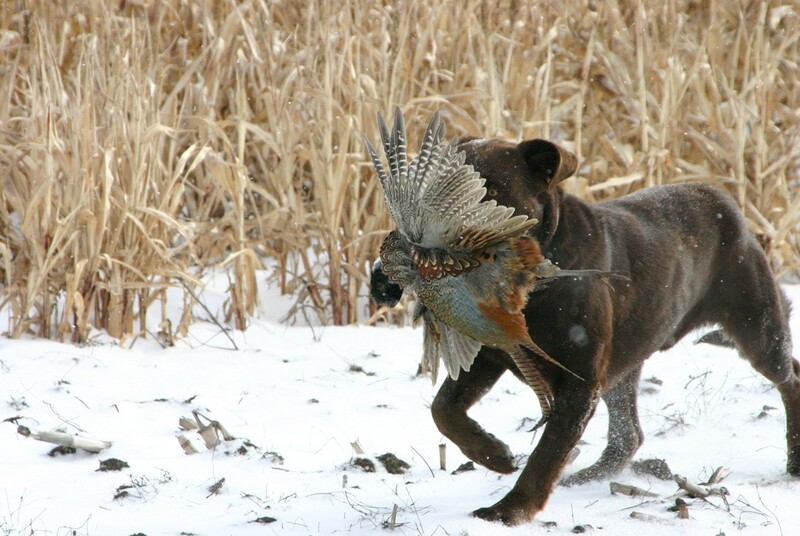 Cory’s dog Ru did a good job and kept watch over the day’s bounty. We laid our trophies out in the snow for a group photo. From the back, left to right are Ned, Steve, Vaughn, and Chris. In the front are Jim, Ed, Rick, Shannon and JJ. 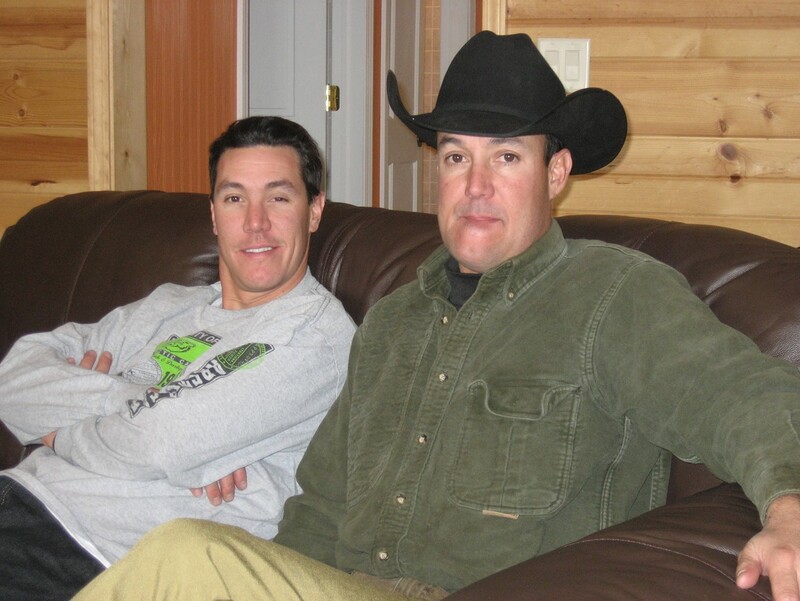 Below is a shot of Rick and his son-in-law, Chris. With a lot of time to kill, some took a nap, some watched television or read a book. 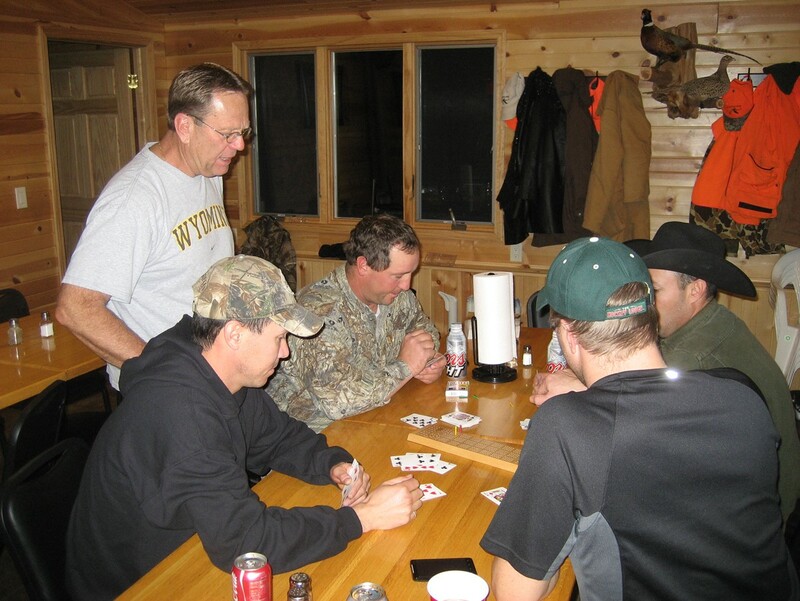 Another group started a game of Cribbage which became the card game of choice for the weekend. 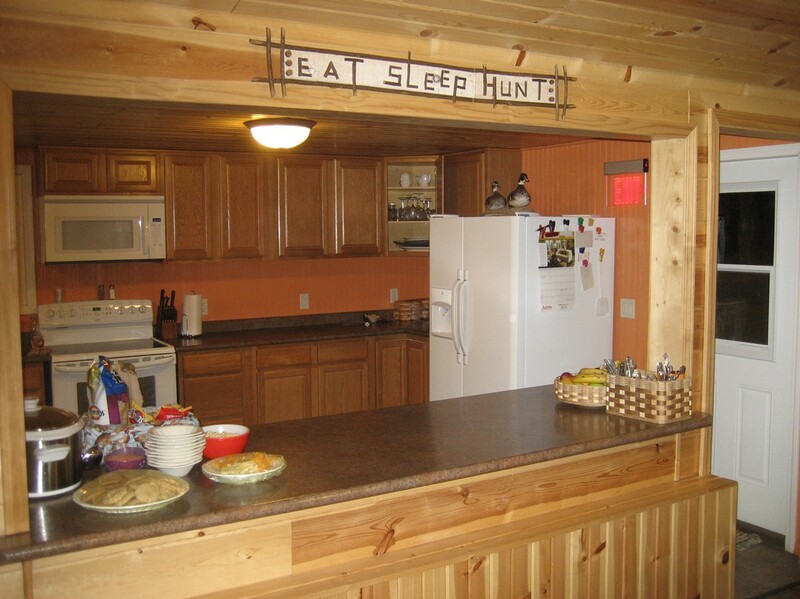 Our sleeping quarters were identical to what you see below. 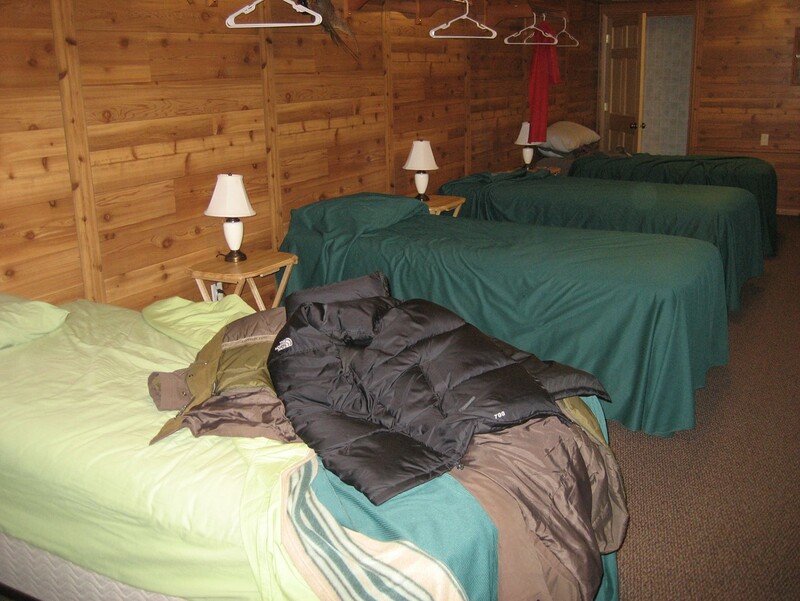 There were four bedrooms with four single beds each. This room was shared by the two loud snorers in the group (me and Ed). 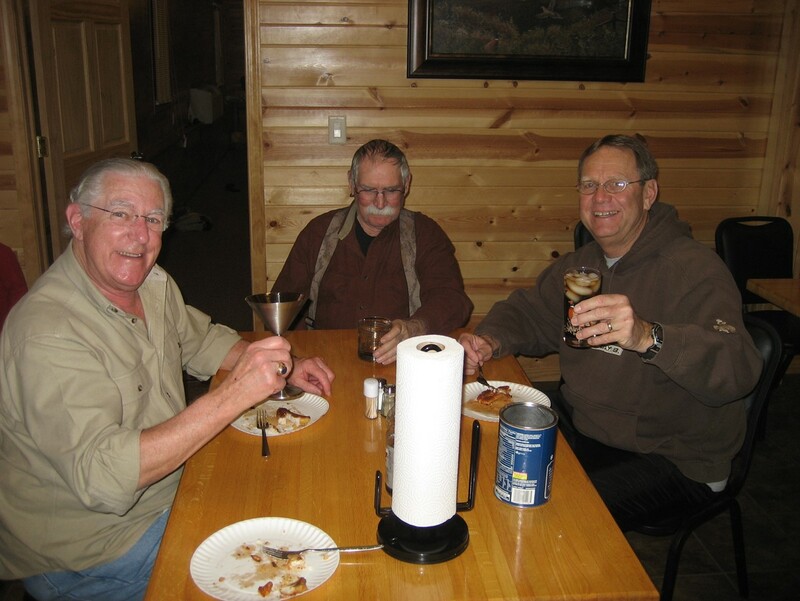 Below, Ned, Jim and Rick are enjoying dessert. The lamp below was part of the furniture. One can see the very clear distinction between the roosters and the hens. I was one who took a few inappropriate (and illegal) shots at hens. 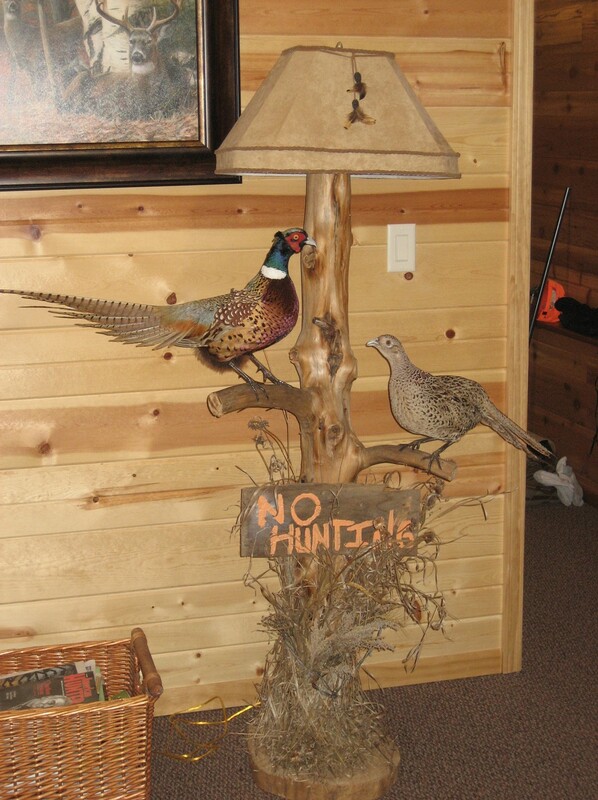 While the distinction is very clear on this lamp, I have to admit I was fooled a couple of times when they flew up right in front of me. Believe me, none of the group let me forget it, either. The good news was that I never hit one. We were very well fed during this long weekend. The main dish on this day was pork loin. 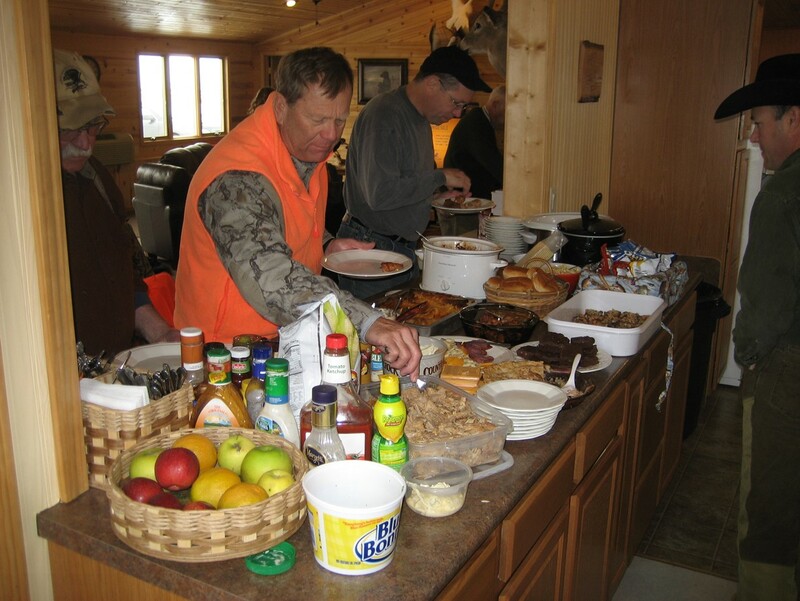 Jim, Rick and Steve are loading their plate on the living room side, while JJ is looking things over from the kitchen. Shannon on the left and JJ on the right are brothers. JJ is a neighbor of Rick’s. These two were ambitious hunters. 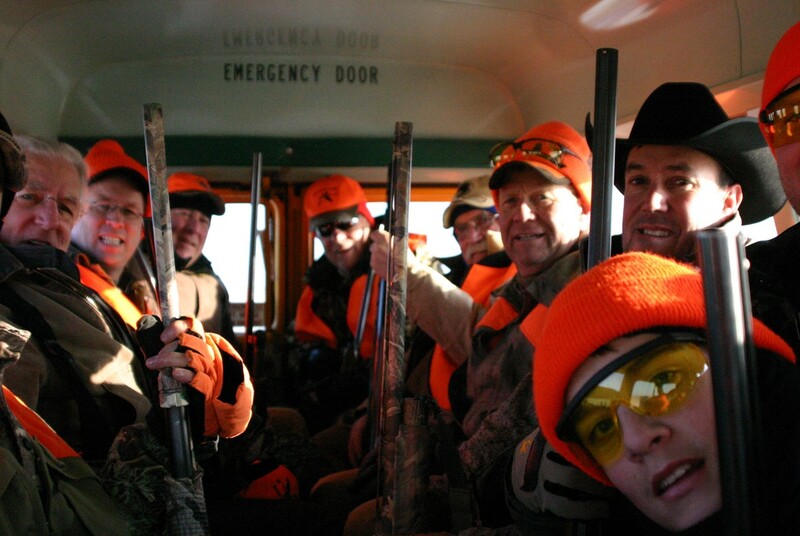 They arose early each morning to go with our guide, Cory to try and shoot a Coyote. They were not successful, but not for lack of trying. Steve and Ed below, are father and son and both are lawyers. There were no end of jokes about that either. 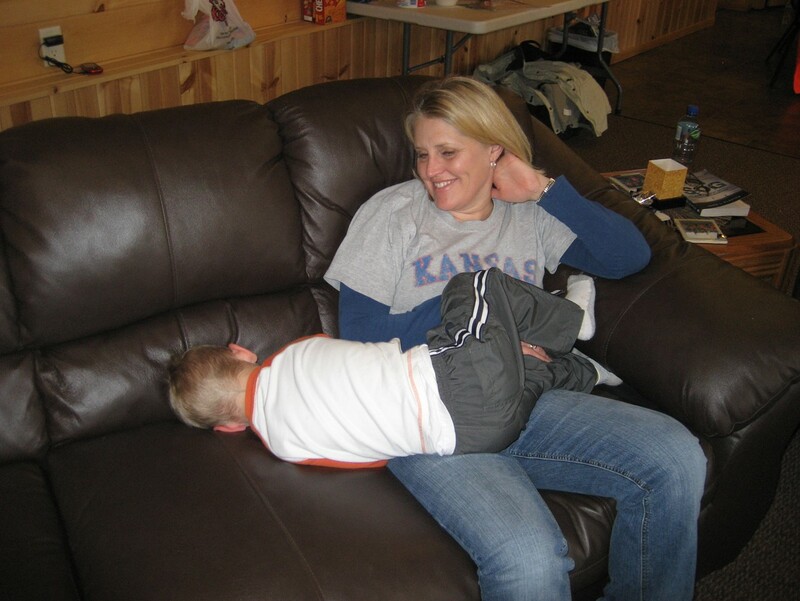 Theresa is shown below with her son Zane. Theresa is the wife of our guide, Cory and daughter of Roger and Deann Zenn. She had a camera trained on us and caught a lot of good pictures. 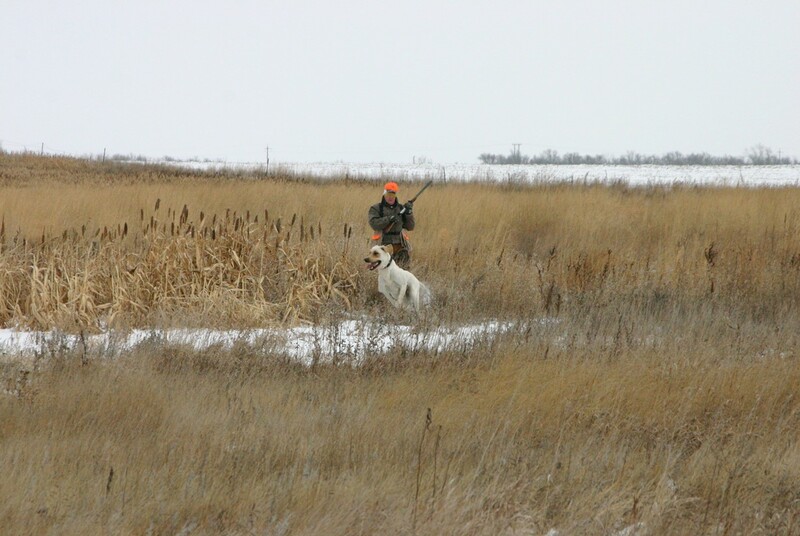 On Saturday we went for our second day of hunting. 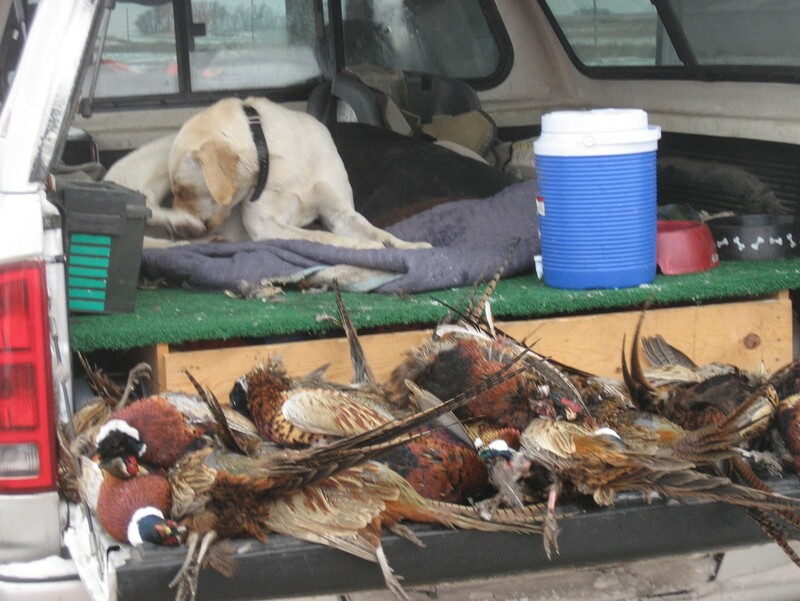 It took considerably longer than the first day to shoot our limit. 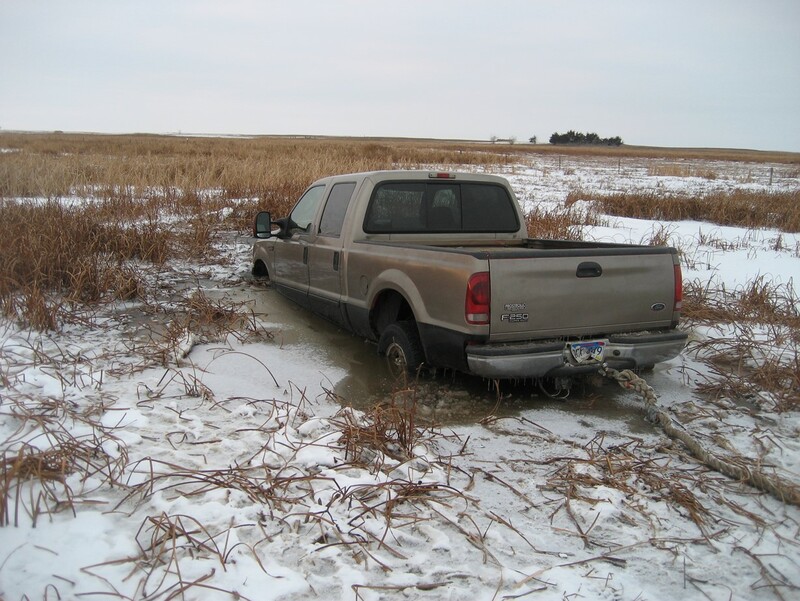 This was partly because Cory’s father, Terry had his truck fall through some ice and get totally stuck. Several attempts over the next two days to free the truck were unsuccessful, including an ambitious attempt with a back-hoe. 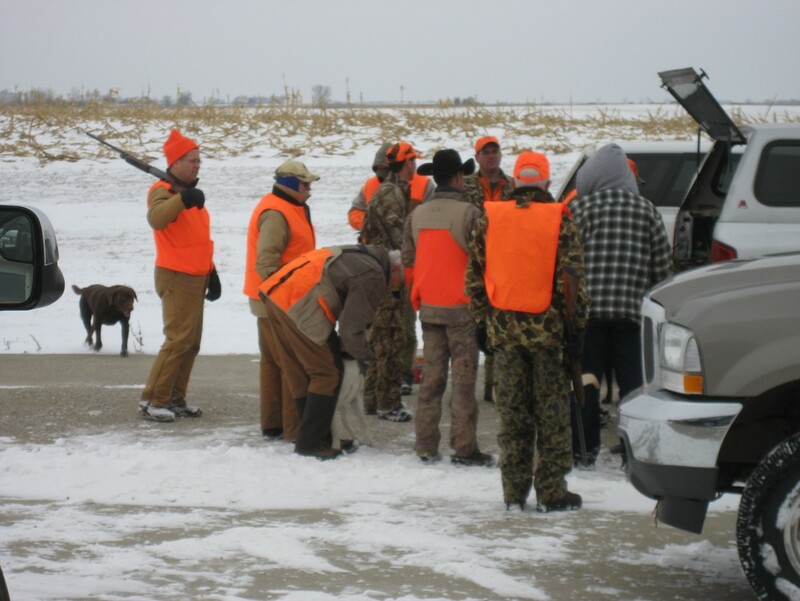 Theresa took some great candid photos of the group hunting. 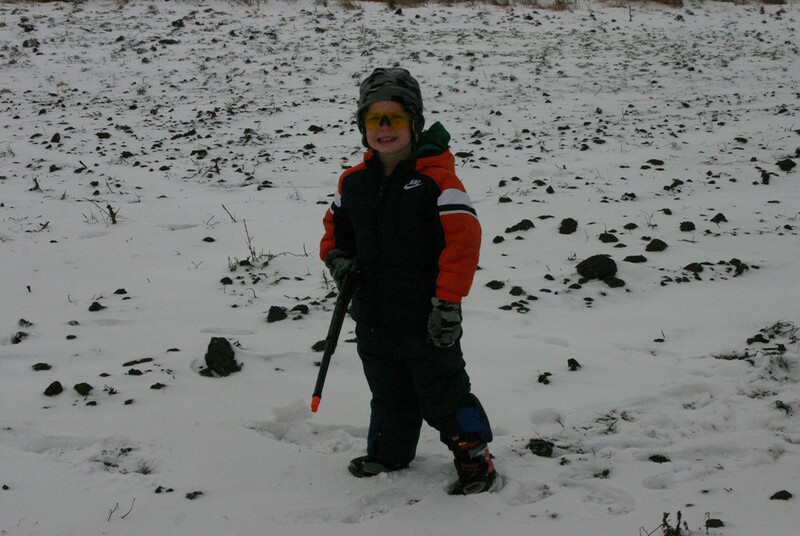 Zane loved coming along with us and carrying his toy rifle. 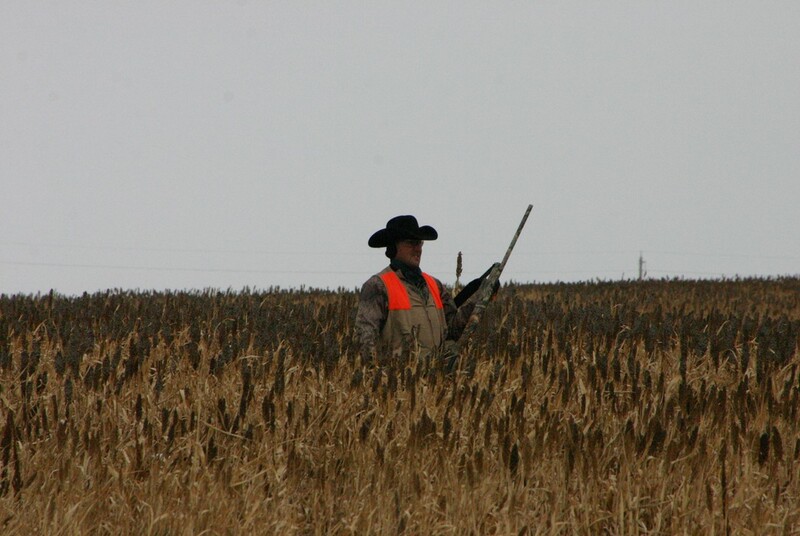 Below is a shot of me ready to blast anything that flew, rooster or hen. Ned is pictured below with Cory’s dog Ru. Ru ran around and jumped on birds that were trying to stay hidden. She also did a great job of locating the dead birds we had shot. 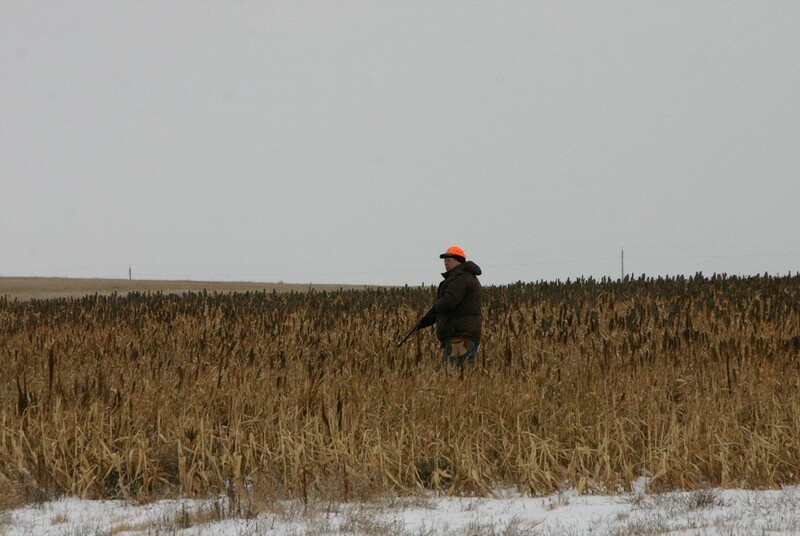 We put blockers at the end and the sides of the patch of Sorghum we were hunting. 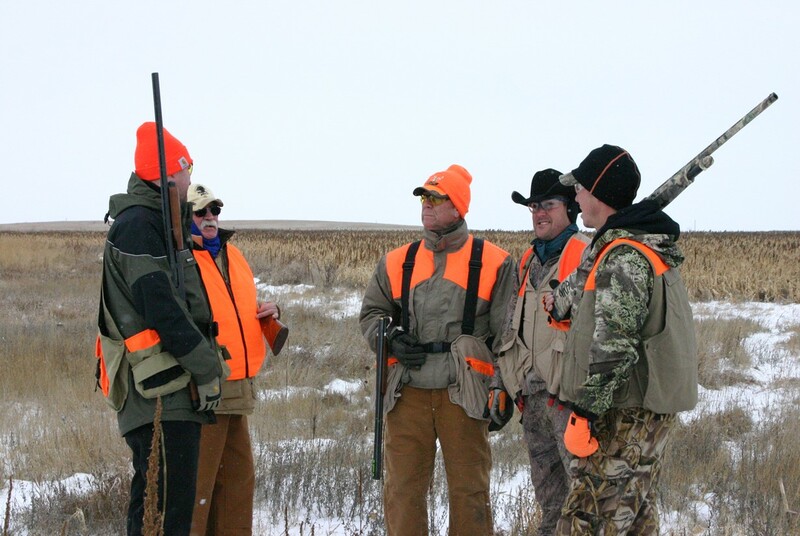 Then 3 or 4 hunters would walk the length of the patch to stir up the pheasants. Chris, below, was one of the walkers who tried to flush the birds for us to shoot. This was our guide, Cory with one of the victims. 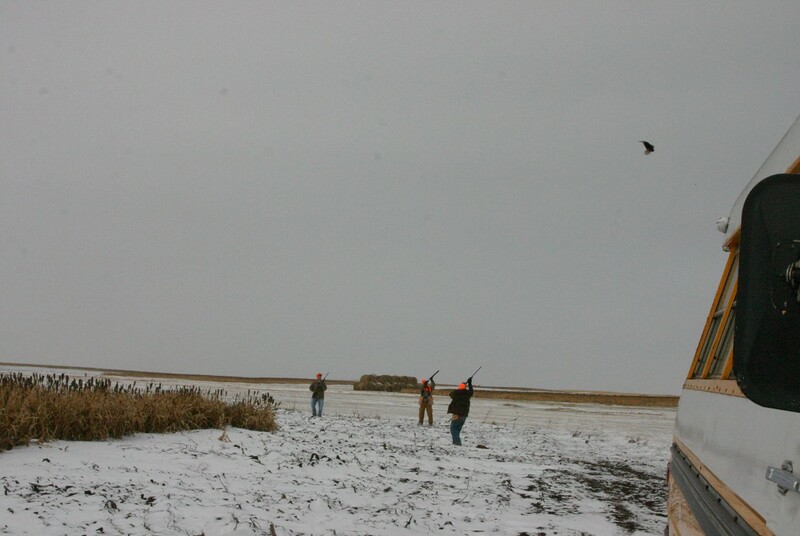 Rick and I will have to argue about which one actually shot the bird shown below. But the bird did become a victim. 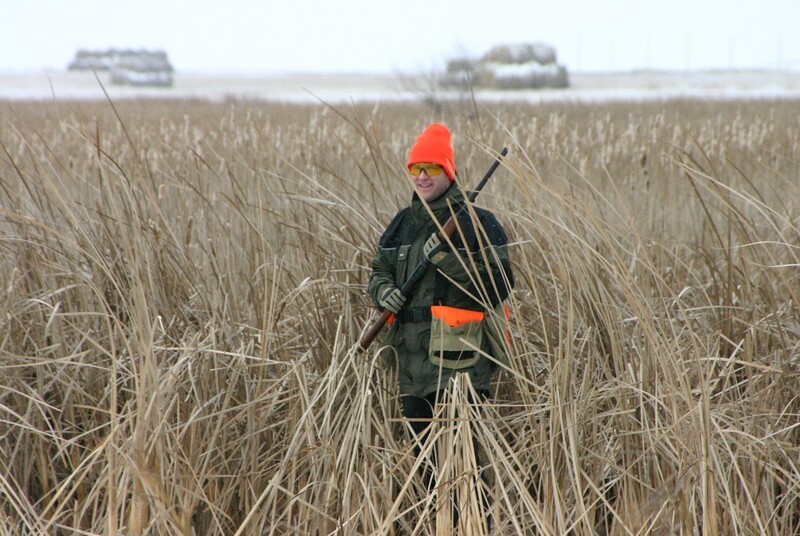 Below is a shot of me as a vicious hunter. The dogs were so proud when they retrieved a dead bird. As you might guess from the picture below, JJ put himself through college on the rodeo circuit. I think he slept in that hat. After we finished with a sorghum patch we gather to discuss the ones that got away. 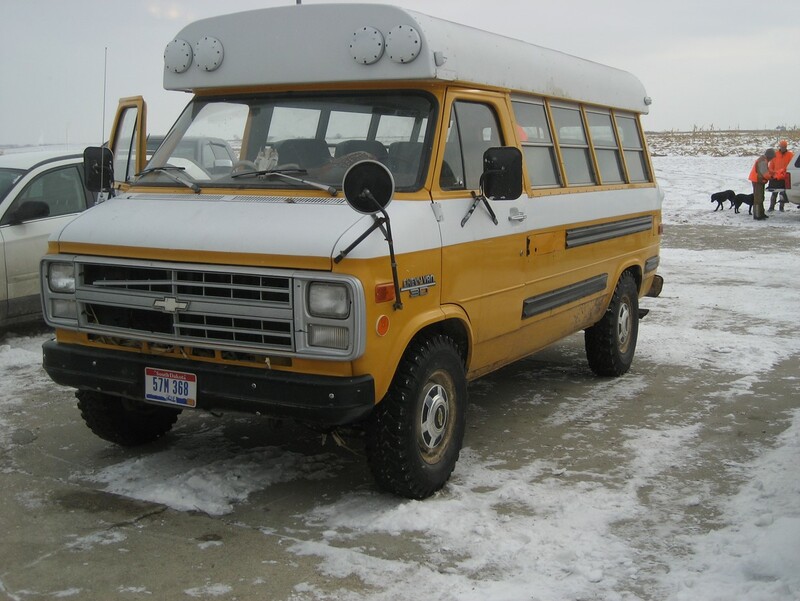 With the demise of Terry’s truck, we all had to cram into the little yellow school bus. Theresa was driving but turned around to catch a picture of the group. The whole long weekend was a lot of fun and I think we all look forward to meeting again next year. 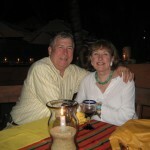 Vaughn Gordy and his wife, Patricia Mulcahy, travel the world. 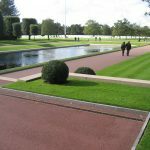 Rather than bore our friends and relatives with slide shows, we choose to make the photographs and log entries available on this website. We welcome your thoughts.